Click to download and print the free sign. An outback theme party is a great way to transport your guests to the Australian outback. This type of party is fun for people of all ages and for various types of events, such as a birthday party or a way to throw your own Survivor party. Outback party decorations can be as simple or complex as you want. Let your imagination run wild to create fun decorations that fit into your party theme. Create your own signs using your computer. Print the kangaroo one above using your Adobe PDF program, or make your own using basic software. Print "Watch Out for Koala Bears" or "Koala Bear Crossing" on bright yellow sheets of paper. Cut the paper into diamond shapes so it resembles real street signs. Hang the signs on the wall around the party room or area. You can also purchase a set of these signs from online party supply retailers. Both options are printed front-to-back, so they can be hung from ceilings or in windows so everyone can see both sides. Party Cheap sells a package of four signs. 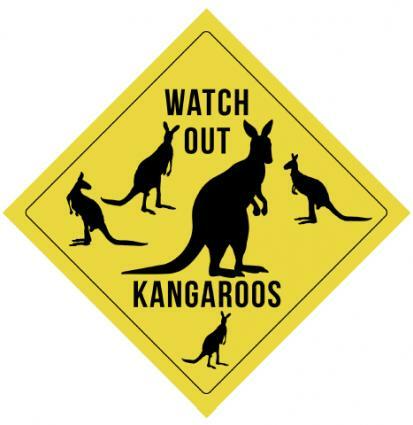 Each sign features an animal--kangaroos, koalas, wombats and Tasmanian devil. Each bright yellow sign includes a picture of the animal and a warning on how many kilometers you can expect to see each animal. The set of four is less than $5. Parties in Packages also offers a set of four animal warning signs for the same four animals, but the picture of each animal differs from the Party Cheap version. These retail for around $12. Fill your party room with the various types of animals and wildlife you can find in the outback. Match your "warning signs" with the cutouts as you decorate your room. Party supply stores online sell big cardboard stand up cutouts of animals, including giraffes and zebras. The animal standee set from Shindigz come in a set that includes a 6' 2" giraffe, a 4' zebra and a 2' 10" elephant for around $40 for all three. Scatter the animal cut outs throughout the room. Hide cut outs behind potted brush, trees or other flowers and fauna you can find in Australia that you have placed throughout the room. Oriental Trading offers kangaroo, giraffe, koala bear and elephant stand up decorations. The kangaroo stands 5' tall and features a mom kangaroo with a baby in her pouch. The giraffe stands at 40 1/2", the koala bear is sitting on a tree branch and stands at 2' tall, while the elephant stands at 54" high. Each costs under $40. Hollywood Souvenirs offers the same kangaroo standup as Oriental Trading for about $33. With a few common craft supplies and some artistic talent, you can also create your own animal stand ups. 1. Cut a flat piece of cardboard into the shape of the animal you want to create. You can use a pair of scissors or a box cutter. 2. Use the paint and the large paintbrush to color in the body of the animal. For a koala, color the entire piece gray. For a giraffe, use yellow and brown paint to create the spots. For a zebra, use white and black to create the stripes. 3. Use the smaller paintbrush and black paint to create the facial features of the animal, such as its eyes, nose and mouth. You can also opt to print an animal face that fits your cardboard stand up from a picture online or to cut it out of a magazine or from a poster. You can then glue the face onto the face of the standup cutout. 4. Cut a triangular piece of cardboard to create the stand. Use duct tape, packing tape or a staple gun to attach the piece of cardboard perpendicular to the stand up. Attach it to the base of the cut out on the back so it creates a stand. Create koala bear masks ahead of time for your guests to wear at the party - your guests will become part of the decorations in the room! Masks can also be set throughout the party space or at each table setting. Click to download and print the mask. 1. 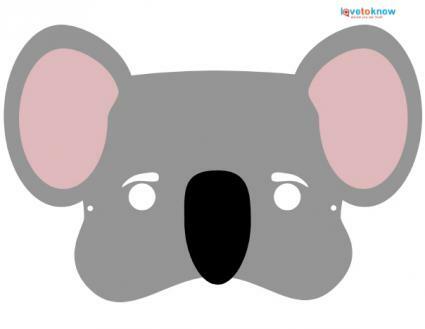 Download the free koala bear mask to the right using a PDF program. 2. Print the koala bear mask out using a color printer. 3. Cut out the koala bear mask. 4. Cut a rubber band so that it is a flat piece. 5. Use a stapler to attach the flat piece of rubber band to the back of the mask so the band holds the mask on the face of the guest. Click to download and print the boomerangs. Australian Aborigines use boomerangs for hunting, so boomerangs make ideal decorations for an outback party. Hang boomerangs on the walls or place them on tables to add décor. You can also hang boomerangs from fishing line from the ceiling of the party room to make the boomerang look as if it is flying through the air. It's easy to make your own boomerangs. Simply print the free ones to the right using your PDF program. Cut and hang on walls and doors throughout the room. 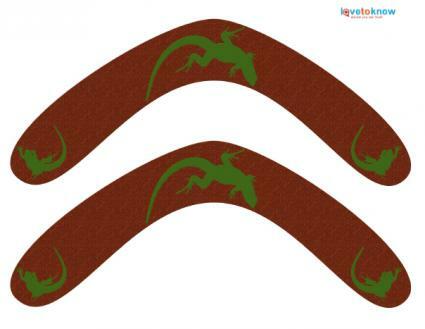 Rangs Boomerangs Australia - Get authentic boomerangs that are made for throwing (you choose right or left-handed) that will also look great at your party. They cost about $34. LA Outback - Handpainted boomerangs are available at LA Outback in sizes ranging from 8 to 18 inches. Prices start around $13 and go up for the brigalow wood boomerangs. These are not for throwing, but only for decoration. Buy or create posters of the different types of animals, plants, trees, flowers and bushes you can find in the Australian Outback. The Australian Outback poster from Amazon is available in 13" x 9" for around $10. The car wreck poster from Cafe Press comes in five different sizes, going from 11" x 16" for $9 to 32" x 48" for $32. The upside down vintage vehicle adds ambiance to a basic outdoor scene. If you make the posters, you can make them as big or as small as you wish by purchasing poster board in the size you desire. A collage poster is easy for anyone to make. Simply print free images from the computer or cut them out from travel magazines and use a glue stick to attach them to the poster board in the arrangement you desire. Travelers who have visited Australia may want to showcase their own photos at the party. If you've visited the Outback, use photo services, such as Snapfish and Shutterfly, to upload photos and print poster size representations of the pictures. Remember to be creative and have fun with your theme. Whether you decide to make your own Outback decorations, purchase pre-made décor, or do a mix, party-goers are sure to have a g'day with their mates!